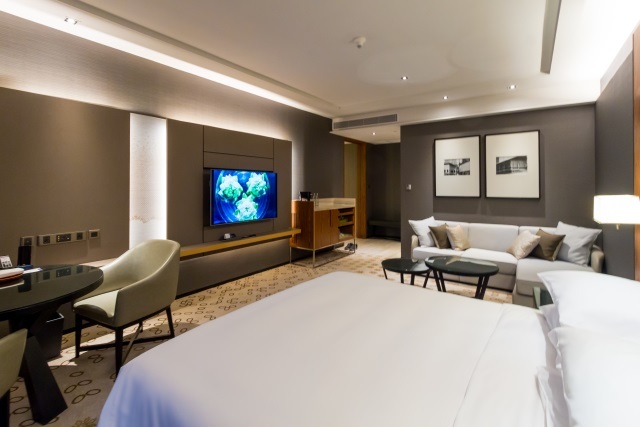 The King Bed Deluxe Room is the next higher guestroom category of Hyatt Regency Bangkok Sukhumvit following the lead-in King Bed Room category. 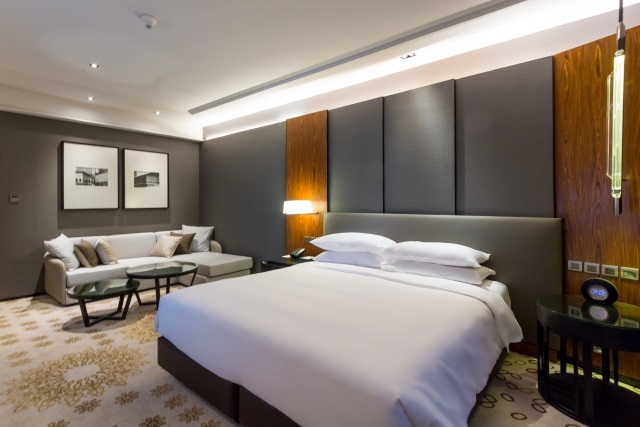 Each floor of the hotel has two units of King Bed Deluxe Room with slightly different room layout and floor area. I stayed in room number 714 which is the bigger King Bed Deluxe Room measuring 57 square meters. 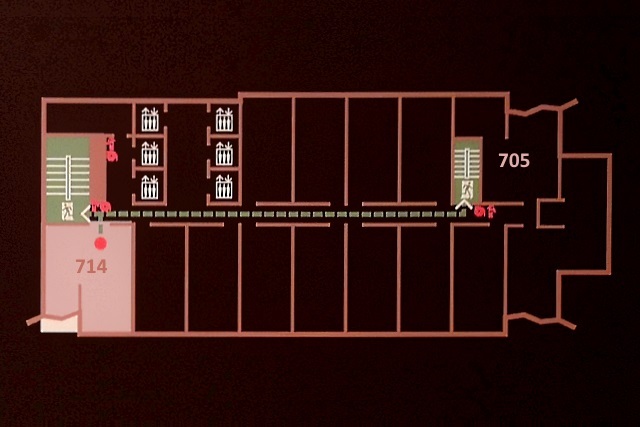 The smaller one (room 705) only measures 46 square meters. Based on the room 705's layout, the stairwell ate up a big portion of the space dedicated to the bathroom. None the less, 46 square meters is still spacious in my opinion. It is also worth to note that my room (714) faces the west overlooking the swimming pool, while the other King Bed Deluxe Room (705) faces east overlooking the main street. So, if you have particular reference towards a room facing the sunrise (east) or sunset (west), I suggest that you mention this in your reservation. Hotel guests arriving at the lobby of Hyatt Regency Bangkok Sukhumvit are served with a welcome drink, but I did not get the chance to drink mine as the check-in went really quick. The front desk manager was kind enough to send me my welcome drink to my room. It was a refreshing drink of iced pea flower tea with pandan which I enjoyed with the bowl of fresh fruits waiting for me in my room. The dominant theme of the room is the mixture of deep grey and brown sand, reminiscent of the interiors of ancient temples of Sukhothai and Ayutthaya. 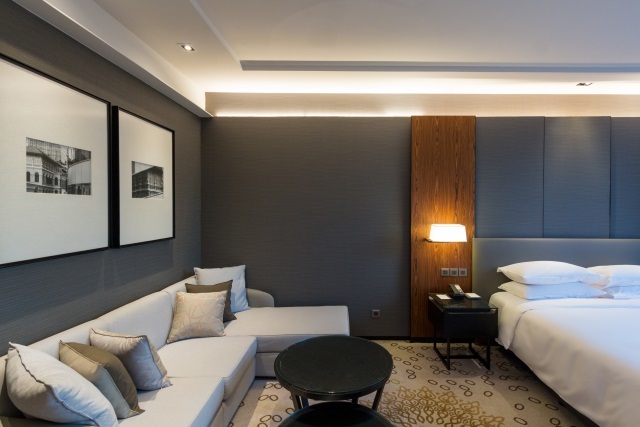 The clean lines and accent lights create an atmosphere of understated stated luxury, while motifs on the carpet and the walls give the room an unmistakable Thai character. 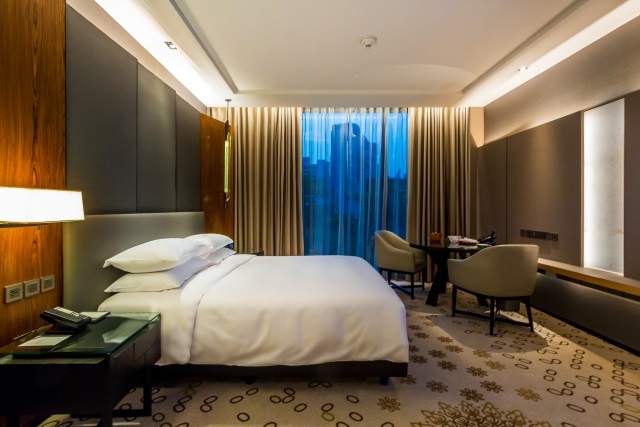 The King Bed Deluxe Room is furnished with a king size bed, a circular dining table that can also serve as a working desk, a lounge sofa and two coffee tables. 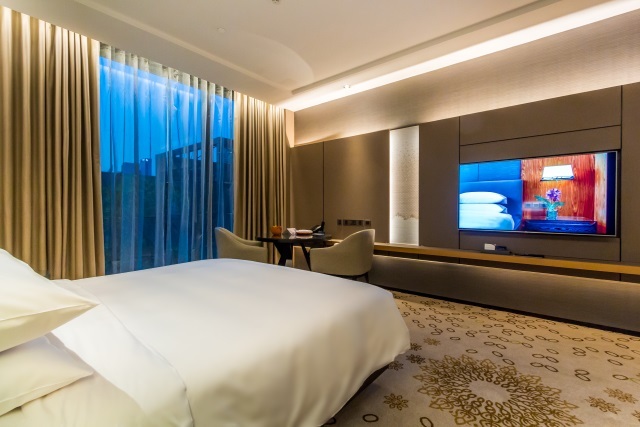 The room also features a 55-inch LED television with local and international cable channels. 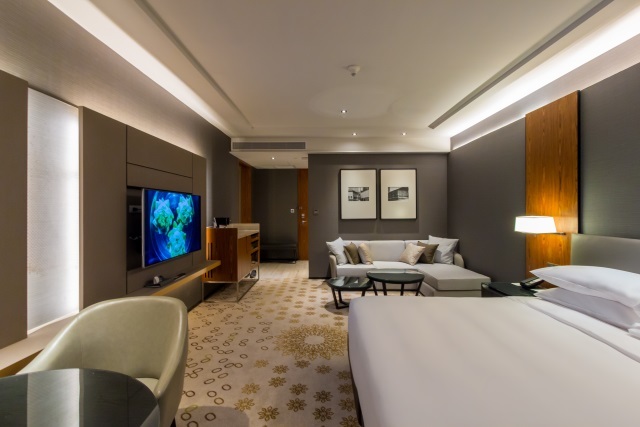 Hyatt Regency Bangkok Sukhumvit is one of the very few hotels in Bangkok that offers its guests with the free use of a Handy smartphone during their stay. 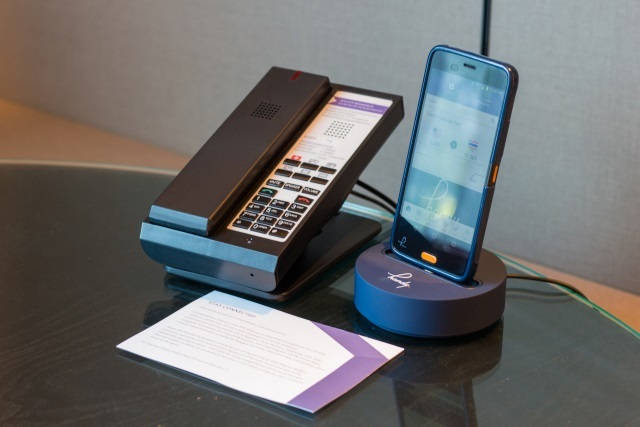 Guests can use the Handy inside or outside the hotel to access the internet and to make local and international calls to up to 10 countries, free of charge. 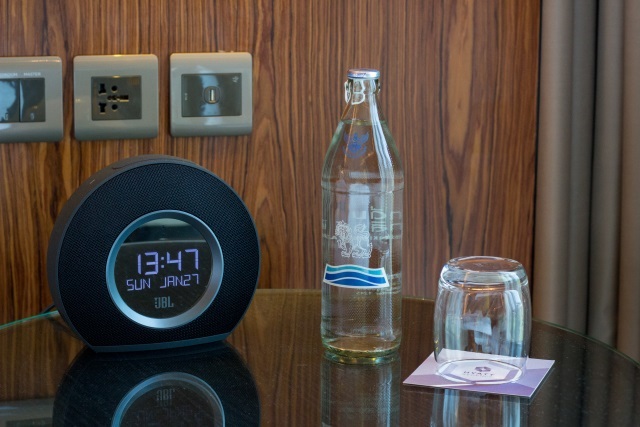 Universal power outlets and USB ports are available next to the bed and the dining table. Sleep quality is the most important aspect of my hotel stays. Working as a full-time business analyst and blogging on side, sleep for me is luxury. This is the same reason why I am very picky with the hotels I stay in. 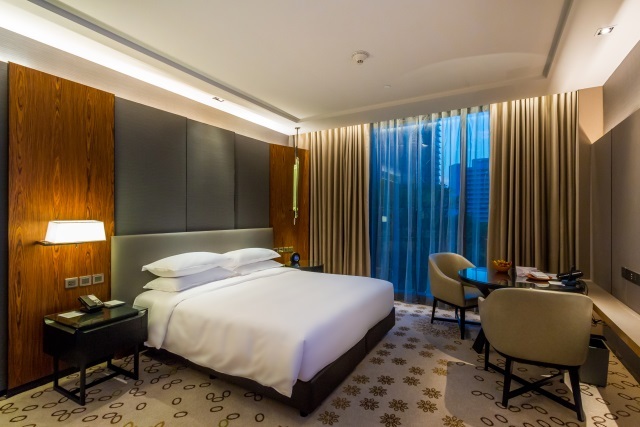 Similar to my excellent sleep experience at Hyatt Regency Manila City of Dreams, I got an uninterrupted sleep for 8 hours straight here at Hyatt Regency Bangkok Sukhumvit. The sofa lounge is my favorite spot in the room. The plush seats were simply perfect for a lazy afternoon of channel surfing. The sofa can comfortably seat up to three persons or a young family of four. The minibar is also conveniently located at arms length, making it effortless to grab a cold drink or snack to enjoy while watching TV. The minibar includes a Capristta espresso machine with Segafredo and Bon Cafe coffee capsules. The machine was fairly easy to use. The instructions were simple and very straight-forward. 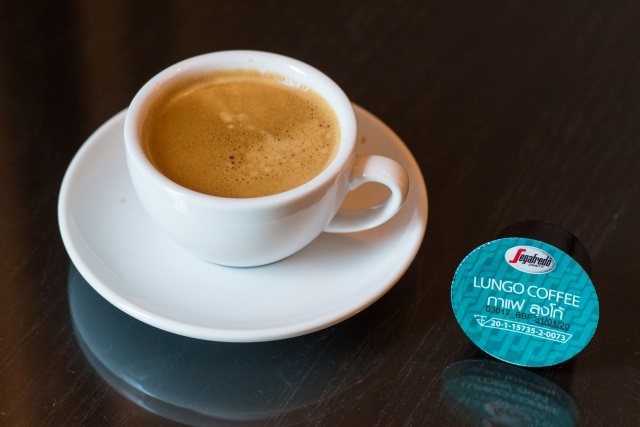 It was my first time to try Segafredo and I have to say that I like the Lungo Coffee, although Nespresso is still my preferred brand. Hyatt Regency Bangkok Sukhumvit also made the extra step of providing its guests with a local Thai premium line of teas. 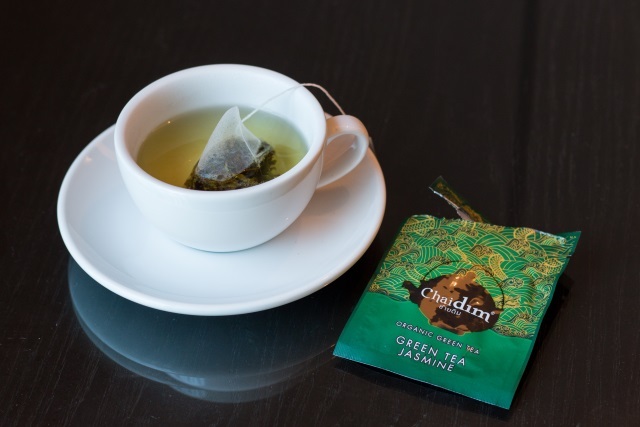 Chaidim sources its tea leaves from northern Thailand and the quality is at par with global brands like TWG and Dilmah. The hotel was very generous to provide four flavors of teas with two teabags each. My favorite is the Green Tea Jasmine. I admire Hyatt Regency Bangkok Sukhumvit for providing guests with drinking water in sealed glass bottles. 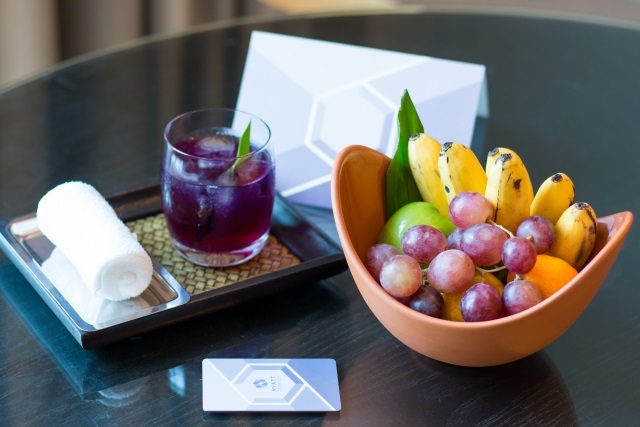 This environment-friendly initiative reduces the hotel's plastic waste output and should become a standard in the hospitality industry in Thailand and across ASEAN. The minibar fridge is fully-stacked with canned juices, soda and beer. 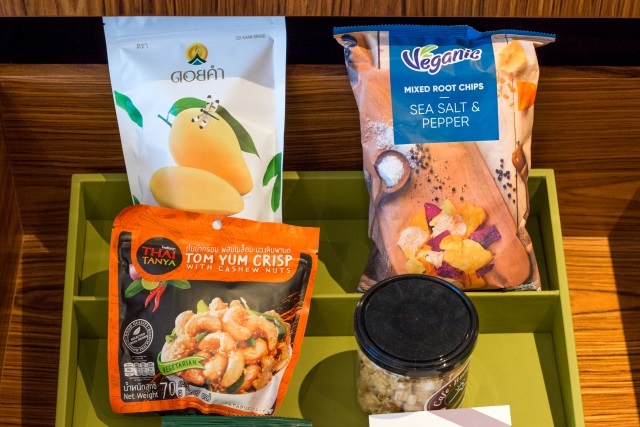 The hotel also showcases locally made snacks such as dried mangoes, mixed root chips, tom yum crisps and mixed nuts. The King Bed Deluxe Room were I stayed has a spacious walk-in closet with plenty of storage space for luggage and for hanging clothes. There is also an electronic safe which is big enough to store a laptop. The walk-in closet connects the bedroom to the spacious bathroom. The walls and the floor are lined with marbles while fixtures are primarily made of dark wood. 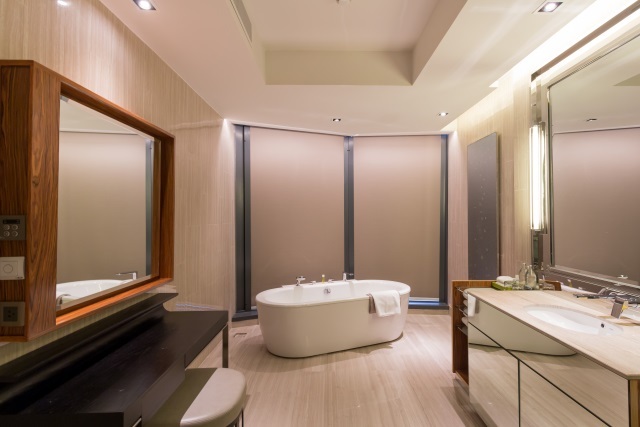 The bathroom is furnished with a vanity table, a single basin with spacious counter-top and a free-standing deep-soaking bathtub. The separate walk-in shower is enclosed with glass and is fitted with a handheld and a rainfall shower-heads. Water pressure was consistently strong and heated water was available almost instantaneously. Water temperature was easy to regulate. Hand towels and bath towels are placed in a glass rack next to the basin. Bath robes and room slippers are placed in the walk-in closet. 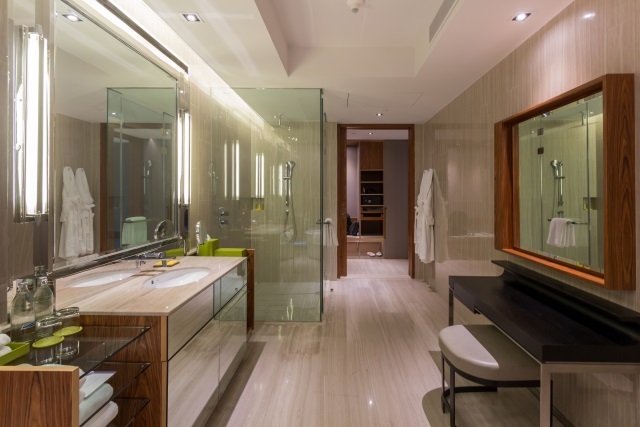 A separate lavatory is located outside the bathroom and next to the room's main door. The toilet is fitted with a bidet spray. 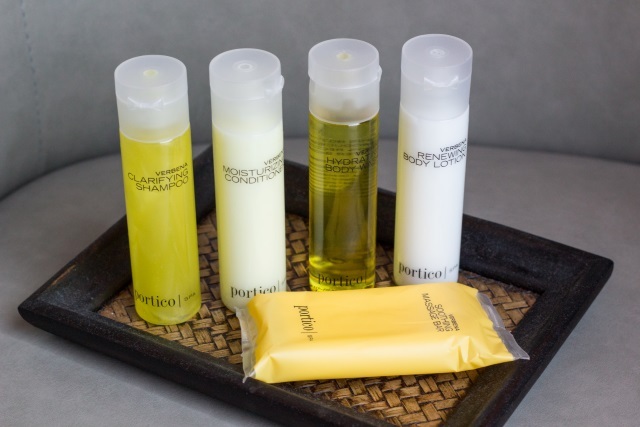 Verbena by Portico Spa is the standard brand of body and bath amenities provided by Hyatt Regency. Its citrus scent gives a refreshing smell to the skin and hair. The complete set includes a massage soap bar, shampoo, conditioner, body wash and body lotion. My work schedule is usually in the evening which means that I stay awake until early morning. I normally eat my last meat of the day around midnight, and I am thankful that Hyatt Regency Bangkok Sukhumvit offers 24 hours in-room dining. I was told that one of the hotel's chef is a native of Chiang Mai and that his recipes were very authentic. This urged me to order the Khao Soi Gai which is a specialty noodle dish from Chiang Mai. 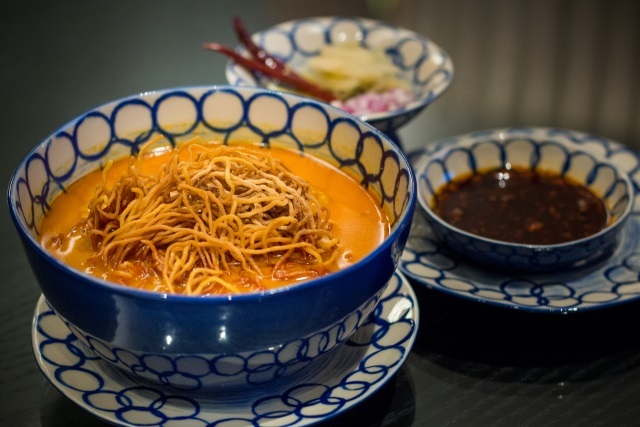 It has a bold curry flavor which is combined with the fragrant spices of Thai cuisine. It is a bit spicy, bot not too overwhelming. The crunchy noodles and the boiled noodles create an exciting contrast of textures. 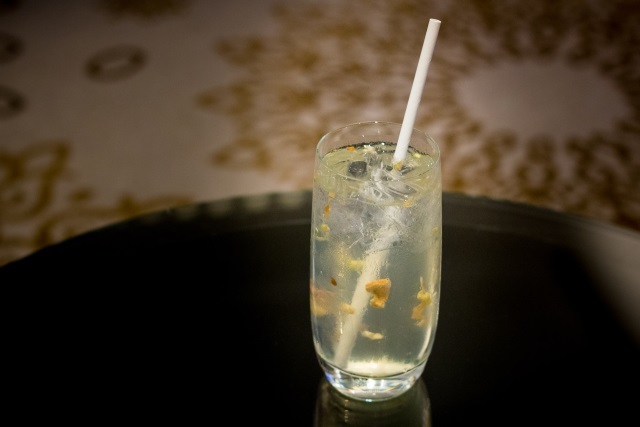 I paired the dish with a Thai lemonade, which is a refreshing drink with the fragrance of lemon grass. It took only 30 minutes for my ordered food to be delivered in my room. Service was very efficient and prices were fairly affordable considering the high quality of the food. Overall, I did enjoy my stay in this King Bed Deluxe Room. I love how spacious it was and the how convenient it was to move around the room. The bathroom was really impressive. 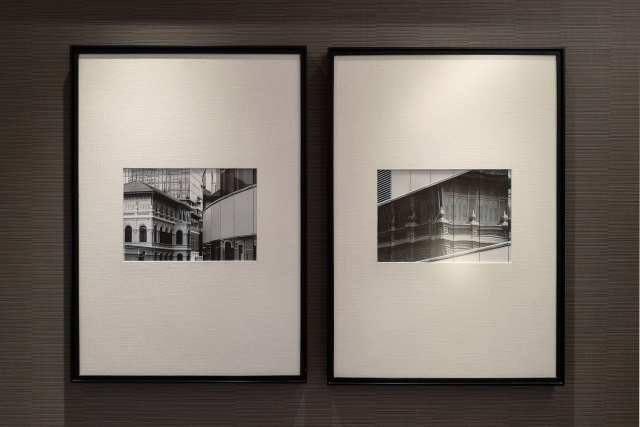 I particularly love the Thai-inspired design of the room, it really made me feel I was in Bangkok. Most importantly, I had very well-rested sleep during my stay. I will definitely stay here again for my future trips in Bangkok.